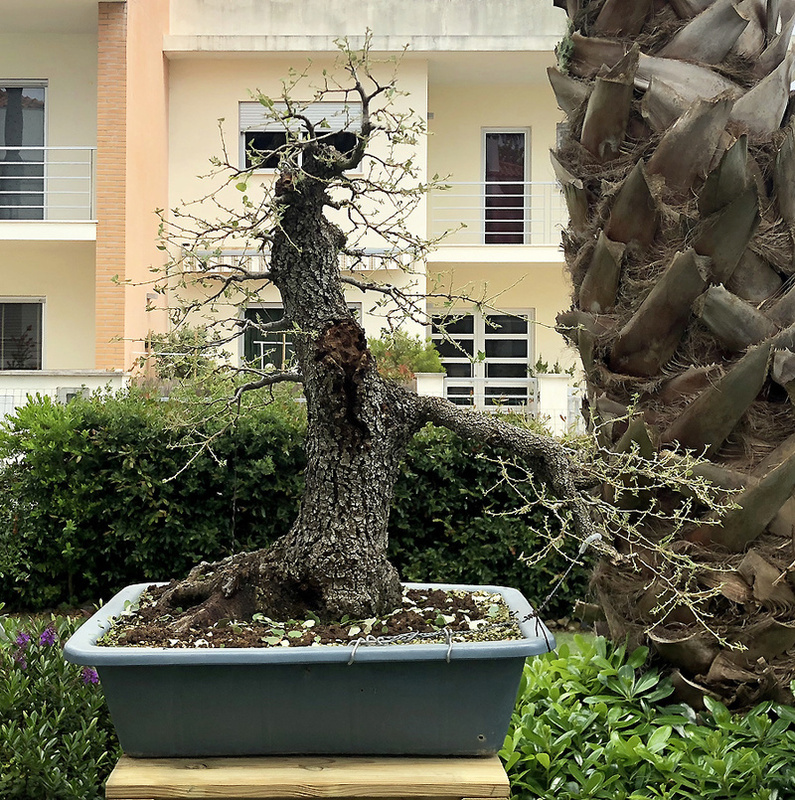 Re: Quercus Ilex from Portugal! I'm sorry did not respond, but I did not receive the notification. 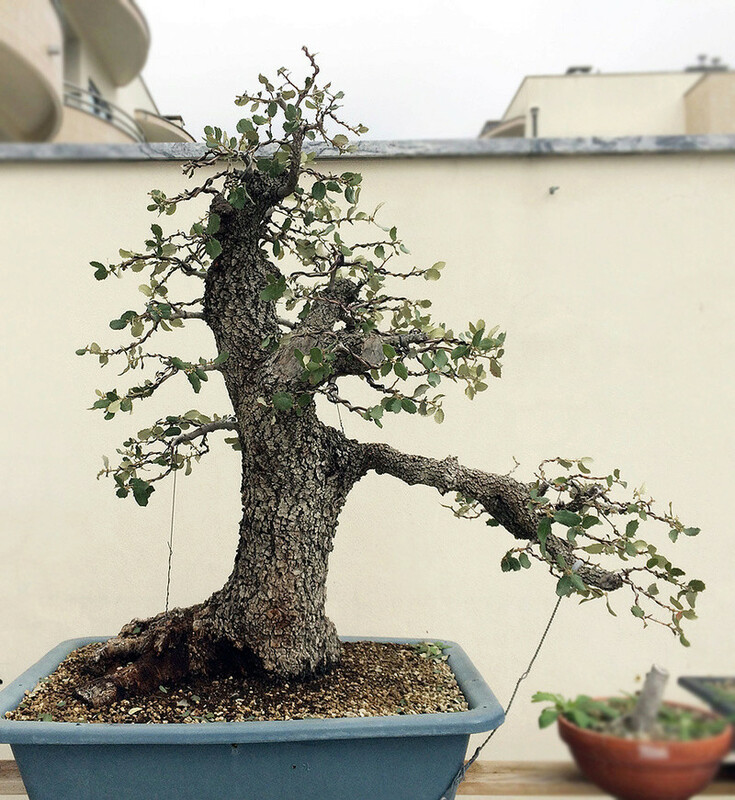 The branch is preferably foldable with a wire bounded in the pot or elsewhere on the tree, not all at once, but within 2 years it changed completely without problems. I do not consider in any way reducing the branch, it makes the tree something unique and unexpected. Cutting would be to end up giving character to the tree. 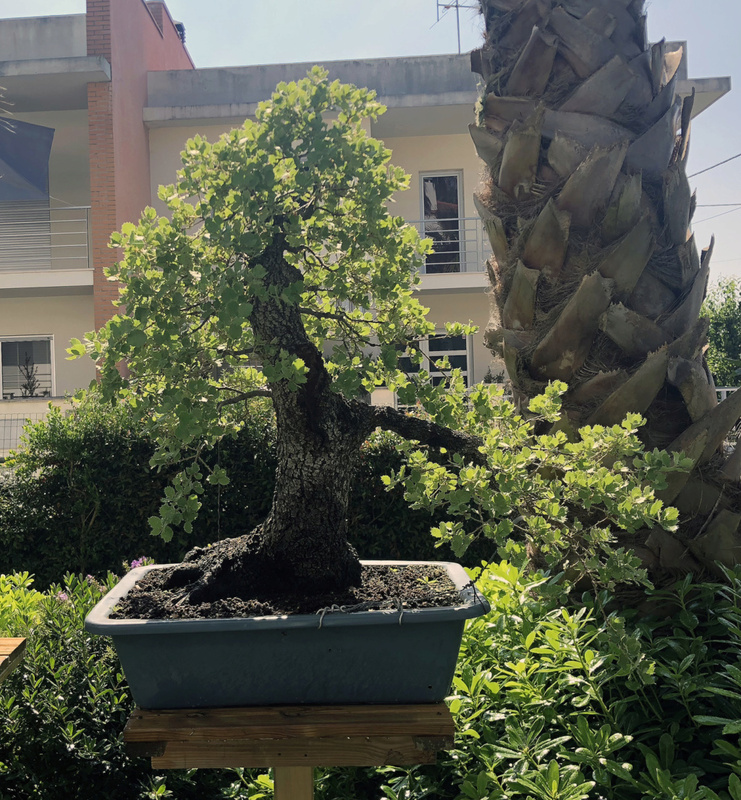 I think it does not make much sense to bend up either, because it is a "quercus", and these species, when they are very old, bend the lower branches even touching the ground. But for now I need to continue to thicken the branches so that they are consistent with the massive trunk. For now the tree was only wire. 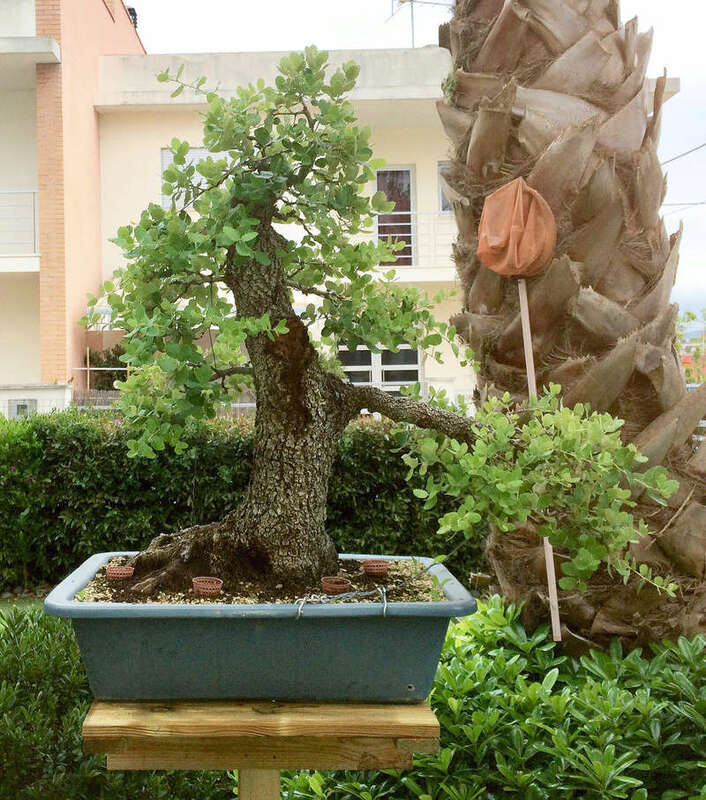 To what you have said regarding the length of the first branch and its movement downward, I would like to say that the base of the trunk to the left side is so powerful that it counter-balance the first "heavy" branch. Furthermore, if the short left branches would build some length more, they will add to the counter-balance of said right branch. This is my personal opinion, of course. But what really bothers my eye, is that the girth of the first branch is considerably less than the girth of the heavy stubbed branch above it. Perhaps some carving would solve or smoother this impression..., I wonder. my nellie wrote: Hello Bruno António! Hi My Nellie! Happy new year to! I'm thinking soon of working on the second and third thick branch, to "disguise" the cuts. Even the base needs some work on the wood. For the rest is to continue to grow to thicken and densify the branches and the green mass. Growth in mid-spring, which has been very cold and rainy here in Portugal. I would definitely remove / jin the thick branches as to me they are too dominant and attention seeking. MKBonsai wrote: I would definitely remove / jin the thick branches as to me they are too dominant and attention seeking. excepting of course that beautiful and powerful first branch, right ? this is a helluva nice start to what will be a great tree !!! Bruno António wrote: I'm thinking soon of working on the second and third thick branch, to "disguise" the cuts. I think you have done very good work! Now you need growth so that new branches get more girth to match the trunk. First defoliation in this tree. It's starting to look funny! It is now expected to sprout again to potentiate further branching and thickening of the main branches. What is your experience/results using this method? Just curious. If the tree is mine it will look like a wild bush with some overgrown branches. Yours look very well groomed. Vlad wrote: What is your experience/results using this method? Just curious. I do not have much experience with this method... but basically it will potentiate a second strong budding within a few weeks (since it was simulated a winter in the tree), which will help to ramify and thicken the branches. In this specie the leaves are already quite small, but in those with large leaves it helps to reduce the size of the leaf. The tree has very fine branching ... it needs to thicken enough to become more credible, which will take a good few years ... I have time! There are certainly a good number of methods to reach your goal. Yours is in my oppinion very very long. But being on the road is a joy, isn't it? Good luck. I do like your tree. There are certainly a good number of methods to reach your goal. Yours is in my oppinion very very long. In addition to good fertilization and to provide good tree cultivation, I do not know of any better method that could potentiate the "forced" growth of the branches and consequent thickening thereof. Not forgetting that you should always leave bouquets of "sacrifice". Which method will be faster to obtain the results that I intend?! defoliation combined with light pruning is a good method to speed up the ramification on a healthy tree. It is a process that is for the tree quite stressful. As a result there are more fine branches and for that season also visibly smaller leaves. The impact on thickening in the season - I doubt there is any. The best method for thickening branches, getting a taper etc is to let the tree to do what it knows the best - growth. As you know sacrifice branch(es ) should be the answer. Vlad wrote: The best method for thickening branches, getting a taper etc is to let the tree to do what it knows the best - growth. As you know sacrifice branch(es ) should be the answer. 4 weeks after total defoliation! I hope you never get rid of that right branch, it makes the tree very cool and I really like it. I just got back from the island Pag in Croatia and I'm pretty sure this species littered the coastline up there. Once you get lower, there are a lot more Pinus Pineas but in the southern microclimate of Pag, it was this oak, another species of oak which I'm not sure about and then what seemed like Olea sylvestris and Olea Europaea. Curious about the "logic/story" behind the style of the first branch, Bruno. If I look at it, I can see a kind of broken branch ( storm, lightning, massive impact of another tree that has fallen over it etc). But then I would expect that the secondary branches there will grow vertically - at least some of them forming another "crown". Something I can see on the first few pics. Now it seems you have changed your concept. Could you share with us your plans with this branch? Vlad wrote: Could you share with us your plans with this branch? The right branch will be to pack more, at this point this is growing free in all directions. I intend to lower this branch even more, precisely to give the sensation of being inclined by the weight of the years (quite natural in specie), and the green mass in it. The 3 branches above this, will also have a slight pendency down, but here the problem is that they are not yet in the desired thickness, which will still take a few years. Bruno António wrote: ... precisely to give the sensation of being inclined by the weight of the years (quite natural in specie), and the green mass in it.